In tough economic times, small businesses are always in search of ways to cut back costs to help improve their bottom line. While the basic expenses of running a business are obvious places to examine for cost-savings opportunities, many small business owners forget another great place to look at saving time. 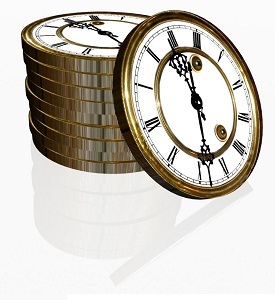 For small businesses which provide services, time is literally money. But even for businesses which provide goods, spending time on basic operations instead of spending time growing your customer base translates into real expense and lost opportunity as well. It’s a good idea for a small business owner to track how much time is spent on administrative and operational tasks as a real business cost. For many small businesses, billing-related activities and chasing payments is one of the largest time frustrations they face that keeps them away from revenue-generating activities. In fact, a very large percentage of small businesses still use some combination of paper, Excel and word processing to create invoices, track receivables and follow-up on payments. Some small business owners struggle to even get their invoices out on time because they are so tired of filling up their days (and nights) with time that isn’t growing their business. Beyond billing, small businesses can easily find automation software for other areas of their business that take up large percentages of time, including e-mail marketing, customer management, expense management, accounting and online marketing. Multiply the hours you spend on the activity today times your hourly salary. This will give you your current cost of the activity. Next, figure out how much time you’ll save by using the automated solution. Most automated billing solutions will provide your business with a 10% to 25% decrease in time spent. Multiply the new reduced number of hours you’ll spend by your hourly salary and then subtract this total from your first calculation. This will provide you with the raw cost savings from automation. Next, subtract the fee of the automation solution from the cost savings you just calculated. This will help you see if there is an immediate ROI from the solution just based on time savings alone. The final factor to consider is how will you use the extra time you will have? If you think the extra time will generate additional revenue, you can add that into your ROI calculation to see the full benefit you’ll receive from automating. Times are tough for small businesses, so it’s important to examine many different angles of cutting costs and not let the time factor go overlooked.